Please join us in welcoming United Regional’s first baby of the new year, Nyla Wren Garza. 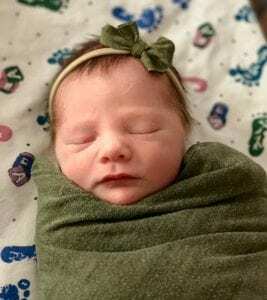 Nyla was born on January 1, at 5:20 p.m., to parents Courtney and Eric Garza. Nyla is their third child. She has a big brother, Ryker (4 years) and a big sister, Thea (16 months). The family is happy and healthy! Help us congratulate them and wish them a wonderful year! It’s off to a great start already!